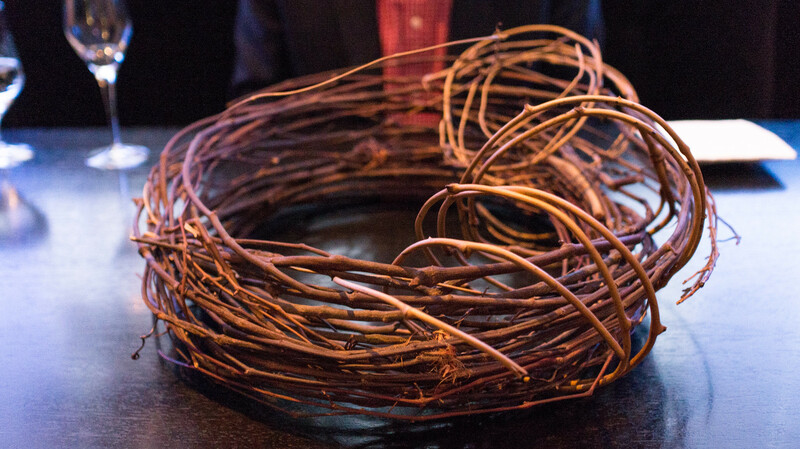 It's followed by something of a sensory challenge: a spiral of woven branches, looking a bit like a "devil's nest" from True Detective, hides two edible items (one for each diner): sticks of chewy dehydrated salsify, camouflaged within the twigs and virtually undetectible except by feel. A dish of skate paired with traditional flavors – browned butter (albeit powdered), lemon, fresh parsley and dill – arrives on a "plate" shaped like a crinkled cocktail napkin, which must be held in one hand as you eat. I don't see how it enhances the experience, though it sure makes photographing it a challenge. 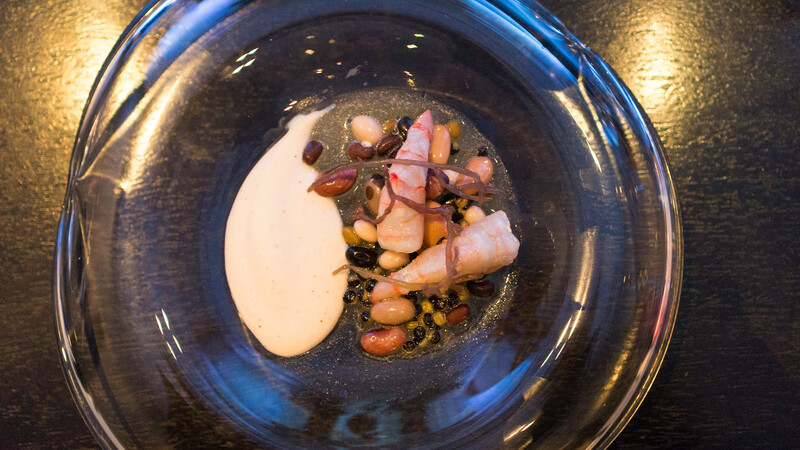 The next emulates a beach-side scene: a couple plump, tender shrimp rest on a bed of "pebbles" (a variety of beans cooked sous-vide, still firm on the outside but yielding within), next to a puddle of a white bean purée that looks, and even feels, like wet sand, some purple-hued ogo seaweed strewn about here and there. That stalk of rhubarb hanging over the table as we're seated? Like Chekhov's gun, you know it's going to be used at some point in the meal. As a salad of celery root poached in red wine, ribbons of celery branch and picked leaves arrives, the server retrieves the rhubarb stalk and shaves fresh slivers of it over the dish. The flavors are bright and refreshing. Achatz was one of the earliest champions of BLiS Gourmet, who make some legendary small-production cured trout roes, maple syrups, and more recently, a bourbon barrel aged fish sauce. 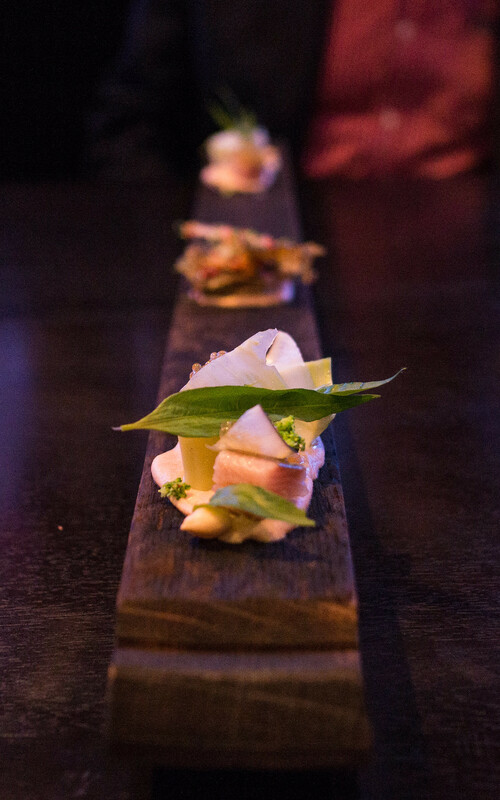 This dish – served on a bourbon barrel plank balanced across the table – was a showcase for their products. On each diner's end of the plank, pieces of delicate smoked trout with mounds of golden roe, bits of broccoli and oyster leaf; in the center, a pile of crispy fried trout skeletons in a sweet-spicy fish sauce caramel. I'm amazed that the Chicago Fire Department tolerates some of the things that happen in Alinea's dining room. 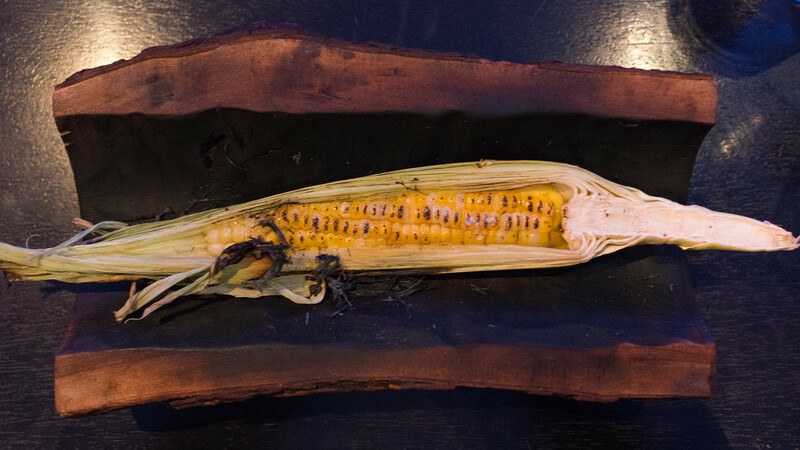 The next series of courses are designed around fire – literally. 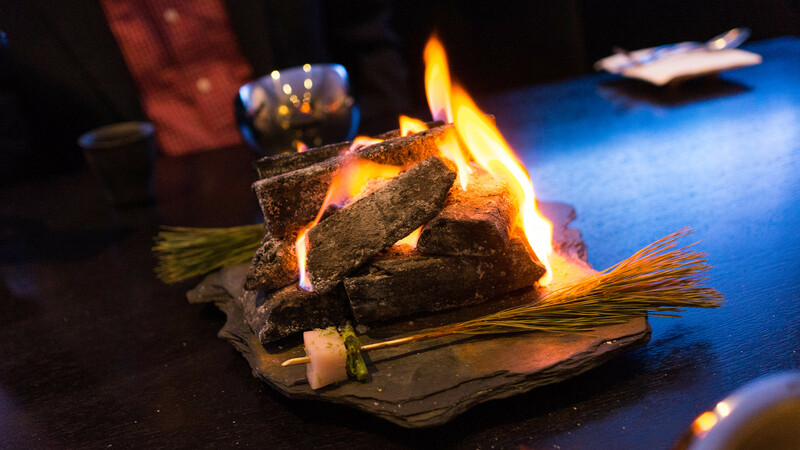 The server brings a slate sheet holding a pile of charcoal which is ignited at the table (I suspect there's some sort of sterno underneath actually generating the flame). 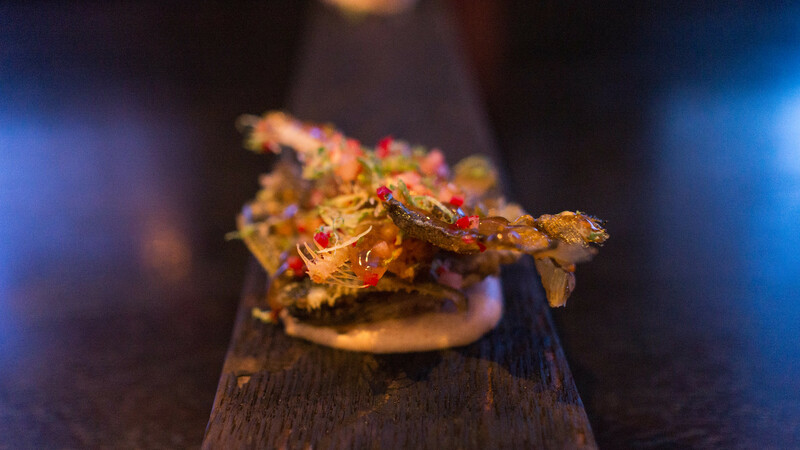 On it are a couple pine branches, each skewered with a cube of hamachi and a shishito pepper. But first,in a small metal bowl are thinly shaved slivers of matsutake mushroom over a tapioca pudding spiked with pine and huckleberries. 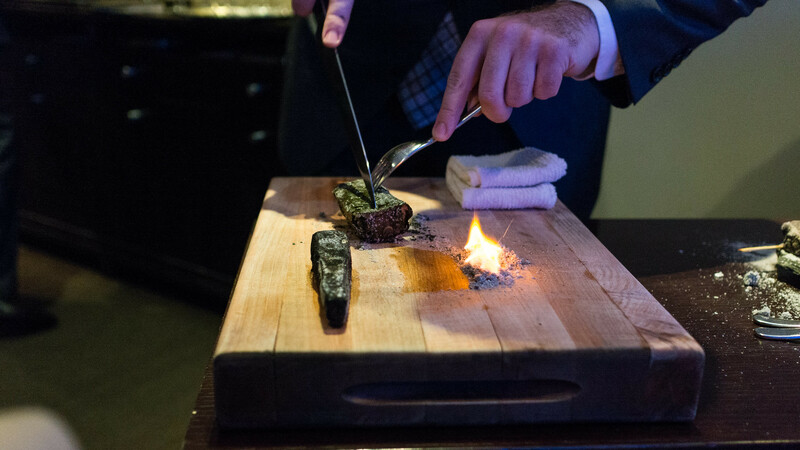 A server holds a piece of binchotan charcoal and flames it briefly with a torch directed at the bowl. It's another big show for a questionable return (binchotan is known primarily for burning at very high heat while being relatively smokeless, not so much for adding flavor as a fragrant wood charcoal like mesquite or hickory might). 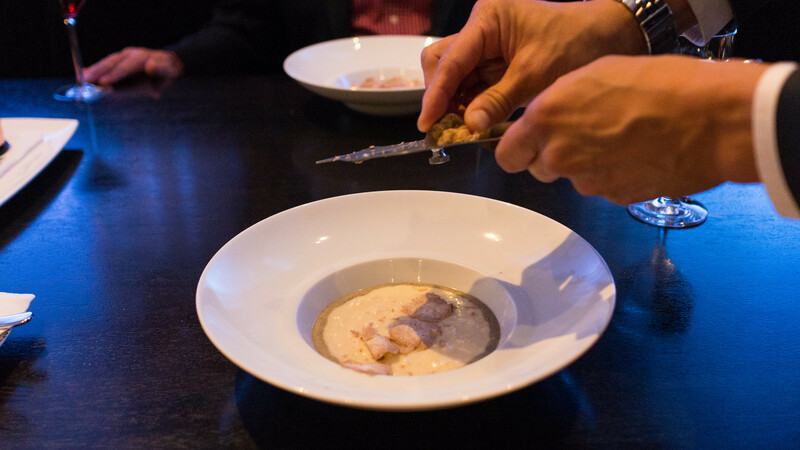 Regardless, the dish itself is excellent, another of my favorites – the matsutakes are delicious, the brief heat releasing their spicy forest-floor aroma, the creamy tapioca stretching and prolonging their flavor. Next, you stick the hamachi skewers into the fire to cook, and when you eat them, get a bit of the pine aroma from the skewer. 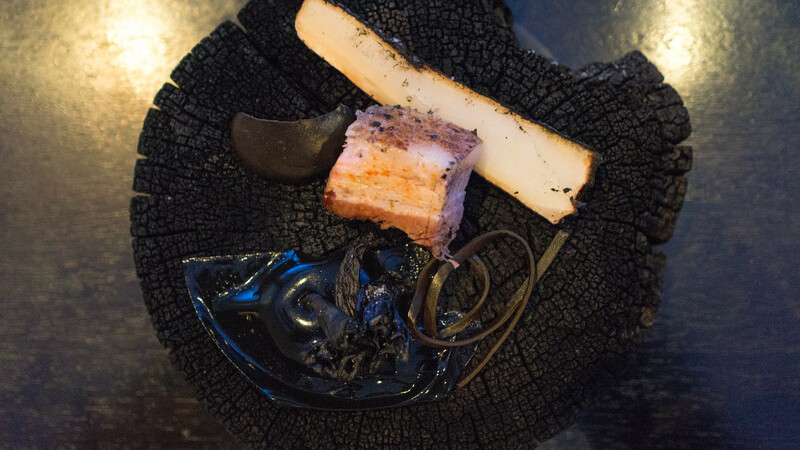 Then – surprise – the server plucks a couple of the logs out of the fire, one of which turns out to be a blackened plank of parsnip, the other a tranche of kurobuta pork belly wrapped in kombu. These are carved table-side, then plated on a blackened tree stump along with black ribbons of kombu, black trumpet mushrooms, a thick, pasty black (squid ink?) sauce, and a gelatinous black sheet of something I can no longer recollect. It's all an incredible, dramatic production. But how does the end result taste? Other than the matsutakes, only OK. 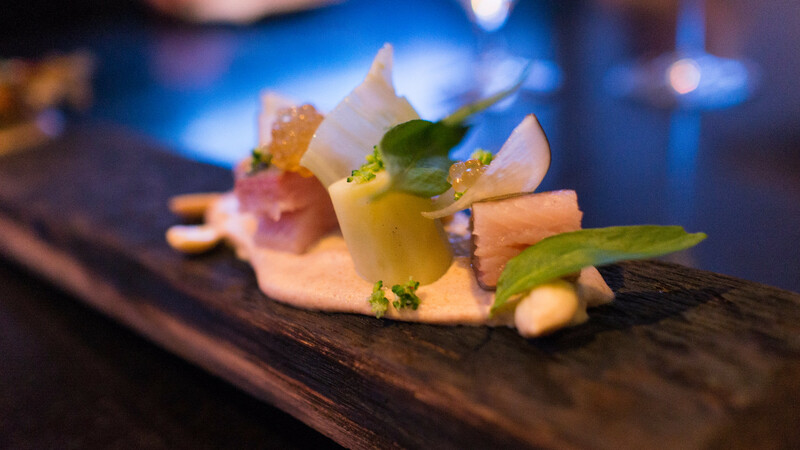 The hamachi is a nice bite, but the parsnip is a bit tough, the pork is a bit dry, and the accompaniments seem chosen more for their color scheme than their flavor. If you're keeping track at home, the "hot potato cold potato" course pictured above came here. And even at eight years old, it's still a brilliant dish. 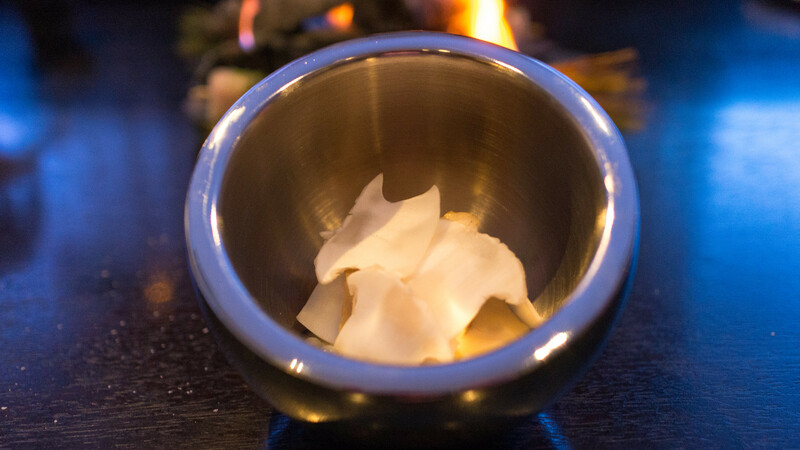 A cold truffle-infused potato soup is served in a small wax bowl (made in-house). 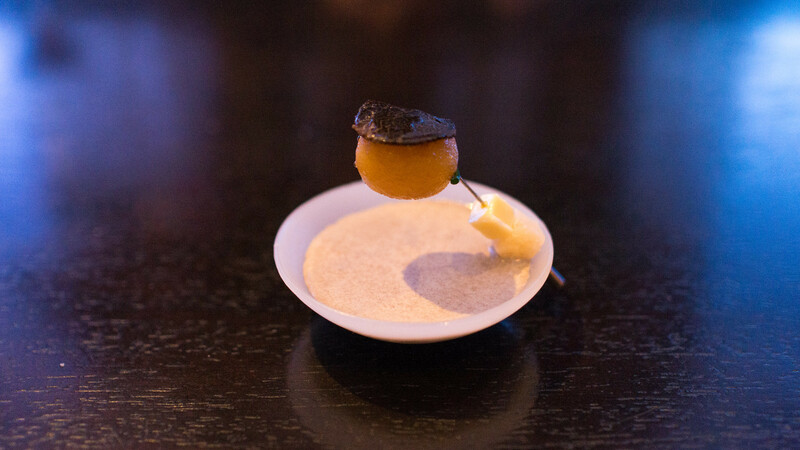 A pin is stuck through the bowl, on which is mounted a warm golden potato ball, a disk of black truffle, a cube of parmesan cheese and a cube of cold butter. You pull the pin, dropping the warm potato and other items into the cold potato soup, and eat the whole thing in one shot. Clever. Fun. And delicious. More foreshadowing: as our server poured the wine for the next course, he noted that it was a hint as to the next dish. So what's a classic Piemontese pairing with Barolo? 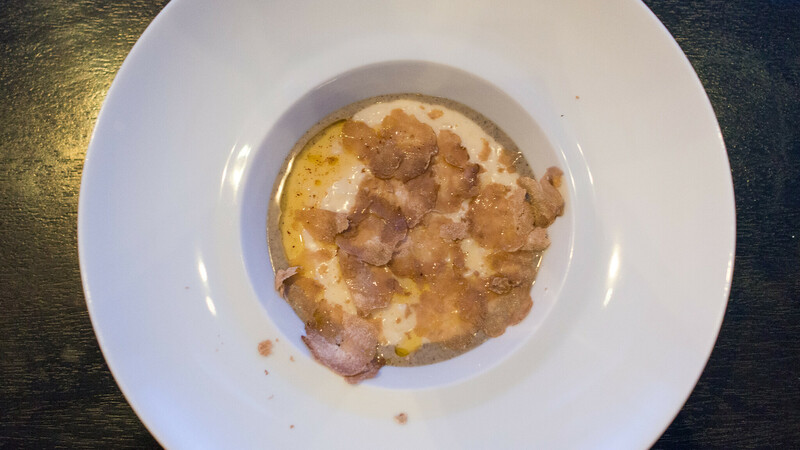 How about risotto with white Alba truffles? Yes, please. And it was an excellent version: silky, creamy rice, but still with a bit of bite to the grains; beautifully fragrant truffles, and a generous hand with them; and a lashing of truffled beurre monté, just in case it wasn't rich enough. The next course was another of my favorites, a study in "dark" flavors. 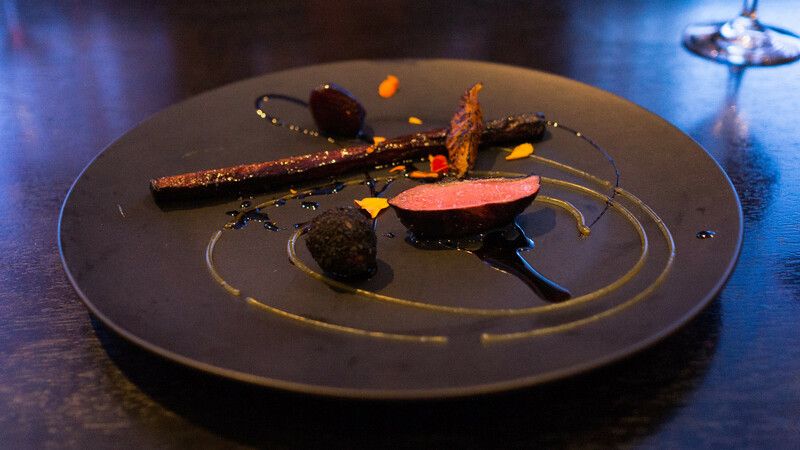 A sanguine-hued, perfectly cooked slice of squab breast rolled in "blackening spices." A truffle of squab offal, rolled in those same spices. A blackened, withered carrot and beet, slow-roasted to extract their earthy, sweet caramel flavors. Some orange for a bit of contrast. This was excellent. 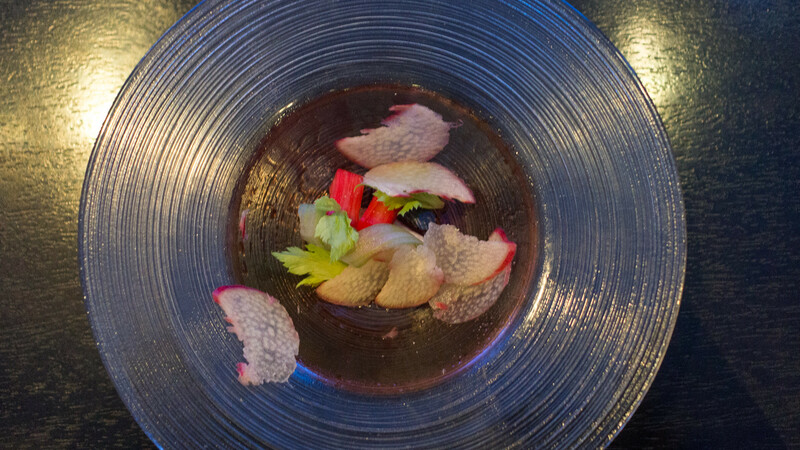 It was followed by another throwback, Achatz's "black truffle explosion," a dish which goes all the way back to his time at Trio (currently the theme du jour at Aliena's sibling, Next restaurant). 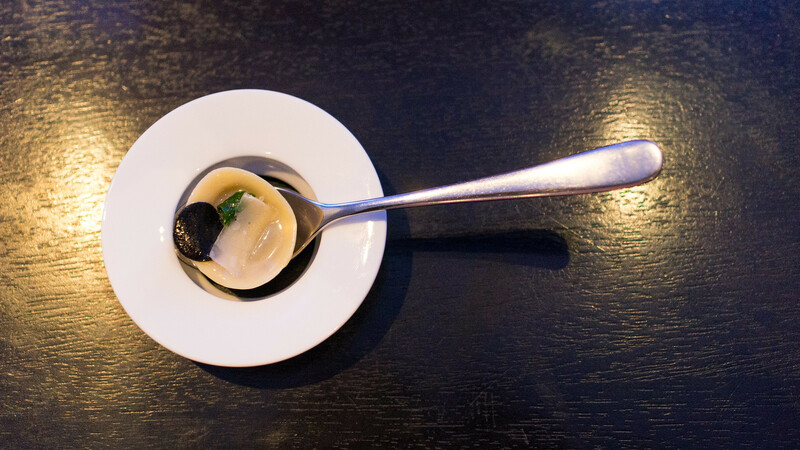 It's a hybrid ravioli / soup dumpling with a gelatinized truffle juice filling, topped with a round of black truffle, a bit of asparagus and parmesan cheese. Nestled on a spoon and then balanced on a Martin Kastner designed "antiplate" (which is hollow in the middle), the warm liquid gushes in your mouth as you bite down, just like a classic xiao long bao. My dinner companion – despite being warned – was still surprised, and I was fortunate not to be wearing the contents of his dumpling. A cheese course marks the transition into desserts. Cubes of winter squash are draped with an ashed goat cheese, some softened, some in firmer shards, all a uniform grey, plated on a sheet of "Chicago asphalt." The server then uses a spray can to "tag" a line of licorice "graffiti" across the surface. It didn't taste like much and the presentation felt contrived and gimmicky. The next dessert was better. Bubblegum flavor has been featured at Alinea for years now (I recall they used to do a dish that combined bubblegum-infused tapioca, long pepper, hibiscus and creme fraiche in glass tubes similar to those used with the iced seafood platter). 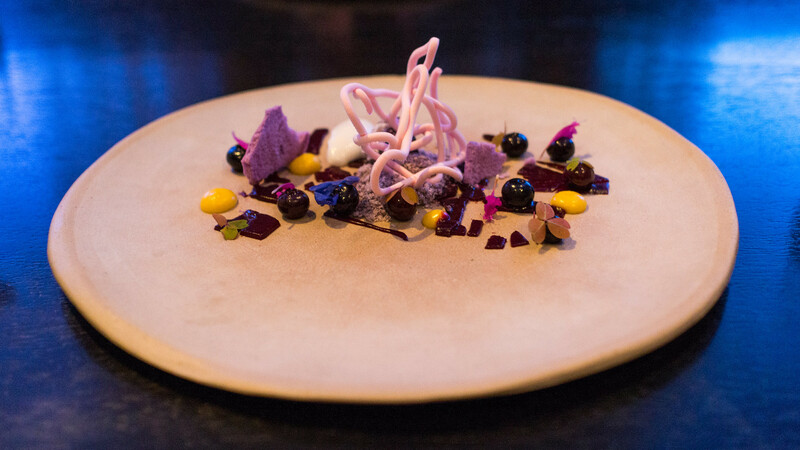 Here, a bubblegum meringue of sorts is wound into a tangle, served with plump, sweet blueberries, lilac, sorrel and a variety of other components. It's contemporary in appearance and nostalgic in flavor. 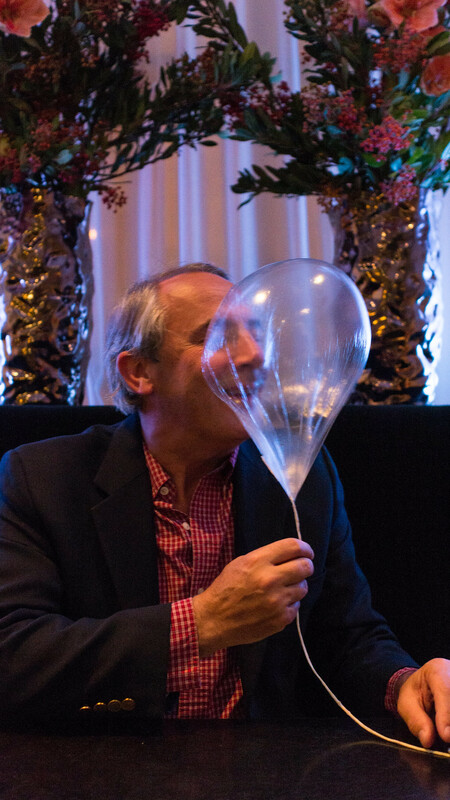 In his twitter profile, Mike Bagale, Alinea's executive chef, proclaims himself the "inventor of floating food." 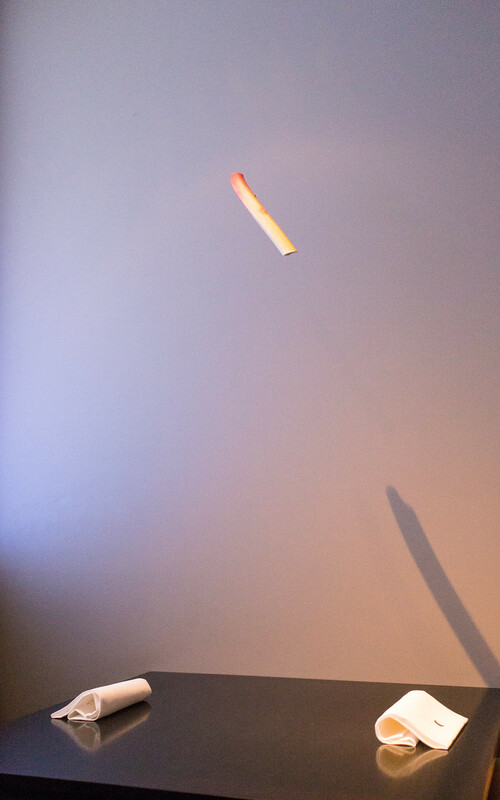 And sure enough, the next course arrives in the form of a floating, helium-inflated balloon, fabricated from a translucent, thin, green-apple flavored, taffy-like substance, and tied with a green apple fruit leather string. Clever? Yes. Delicious? About as much as a Starburst fruit chew. 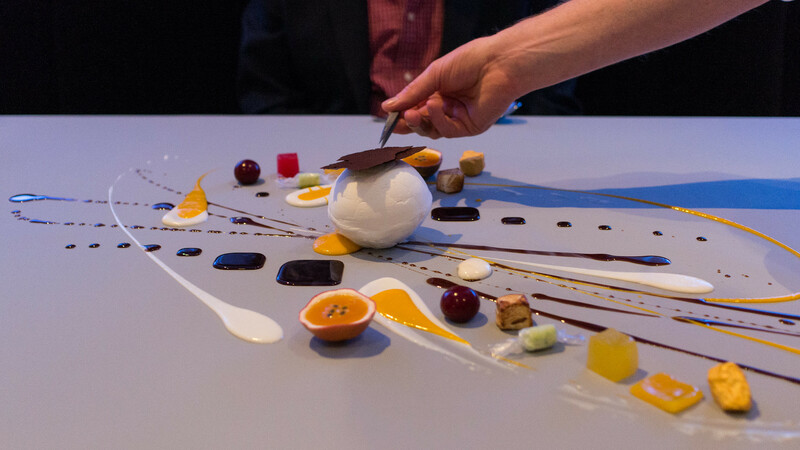 Chef Achatz himself came out to plate the final course, Alinea's now-famous dessert on the table. A silicon sheet is rolled out over the table and then a myriad of different components, here all with a tropical motif – rum, banana, pineapple, passionfruit, jackfruit, kaffir lime, coconut – are scattered and splattered over its surface, finished off by smashing the frozen orb in the center and dusting everything with shimmering sugar glitter. It's a great show and a great finish to a meal: there's a wonderful interplay of flavors and textures, and it's just plain fun to scoop and mix different bites of your dessert right off the table. "When we talk to people in the industry that are now aspiring to open other restaurants, we always say, 'What's the story?' Because opening a restaurant without a story, without a backbone, it's soulless." 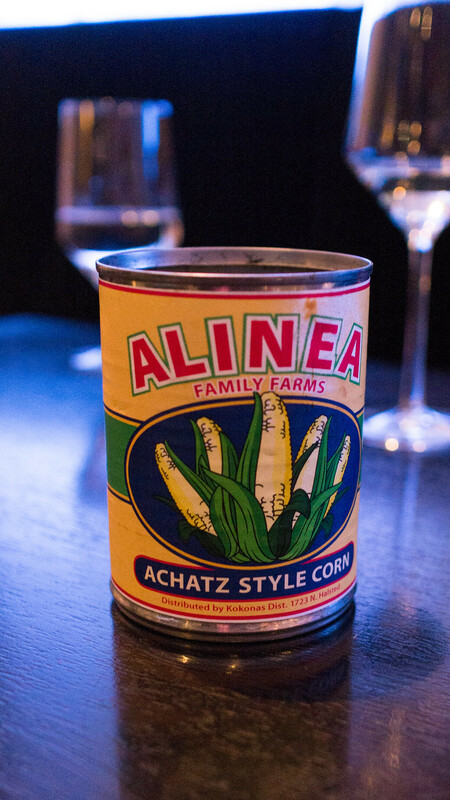 So what is Alinea's story? On one hand, every dish is its own little vignette, each in its way not just food but an experience. But on the other, there doesn't seem to be any underlying theme beyond that notion of dinner as theater: there are lots of interesting things happening, but nothing that really ties them together. 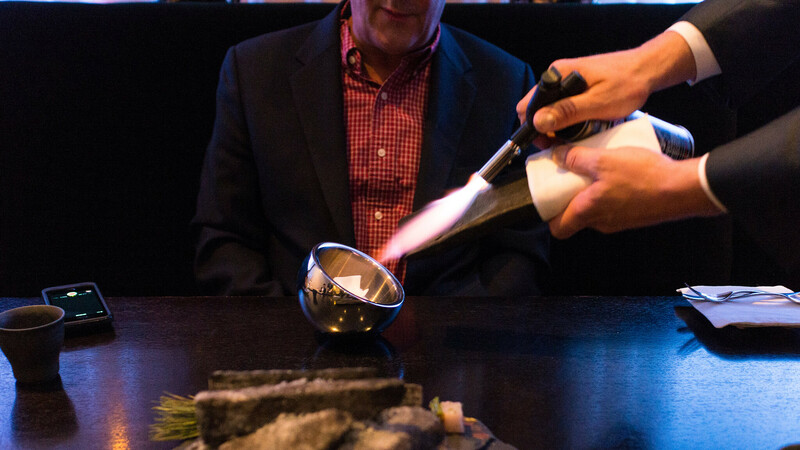 As a result, Alinea can feel more like a variety show than a story. There were some moments in this meal that were transcendent: the corn, the lily bulbs, the matsutakes, and the squab were as good as any dishes I've had this year. Some others were powerfully evocative or playful as experiences, like the pork and parsnip "charcoal," the "hot potato cold potato," the risotto and Barolo, the table dessert. And then some just seemed like gimmicks: the skate in a "napkin," the squash and goat cheese "graffiti," the balloon. When presentation becomes such a key element, there's always a danger of descending into shtick, and there were also some moments that felt more like Barton G than a Michelin three-starred restaurant. With at least a few of the dishes, if you divorced them from the show and served them simply on their own, they would be unexceptional. 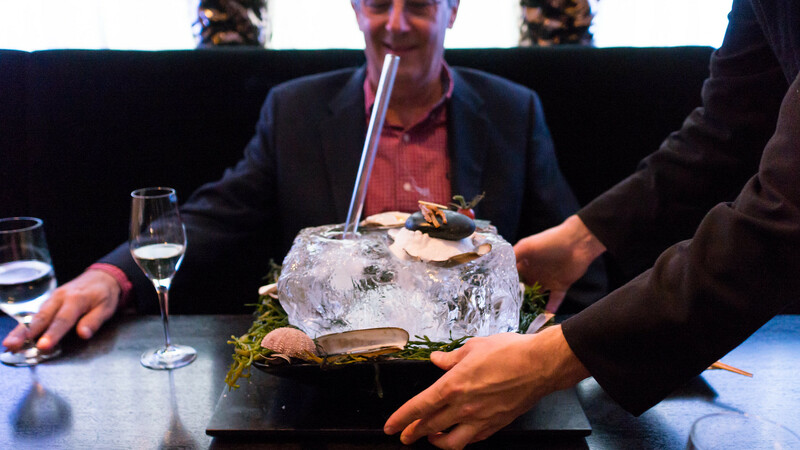 But I suppose the point is that at Alinea, they can't be separated: it is all part of the experience. And it is a great experience. 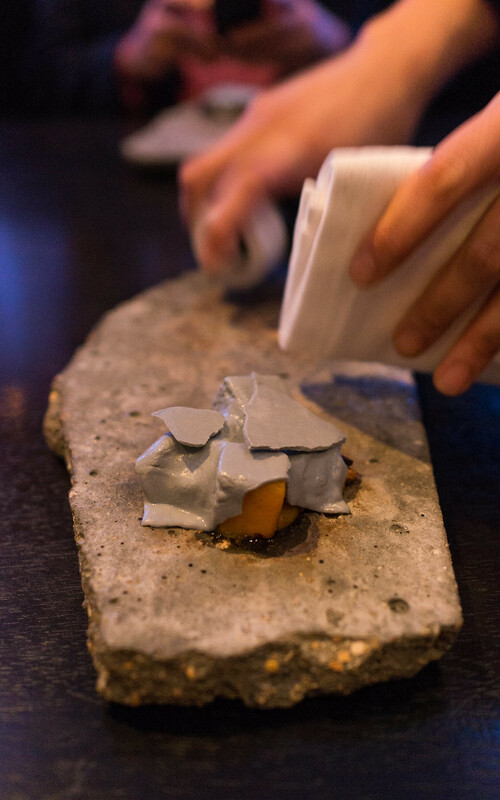 Indeed, Alinea picked up a James Beard Award for Best Service in 2010. 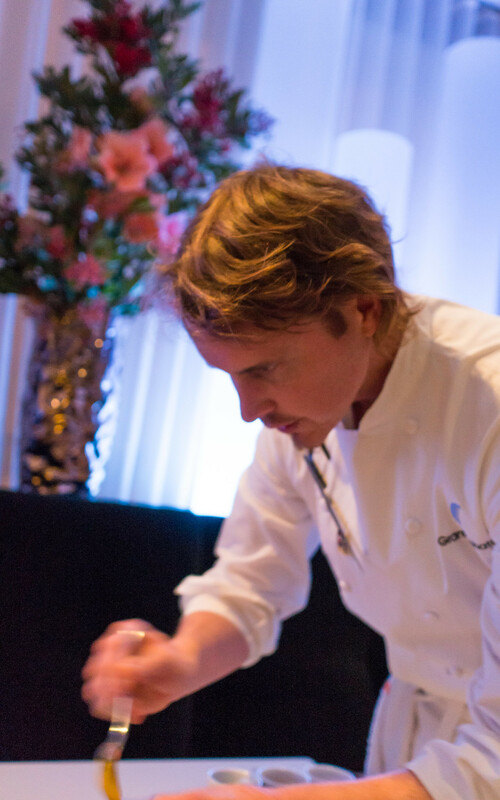 Achatz surely has achieved the Beard equivalent of the "EGOT": he's won Rising Star Chef of the Year (while at Trio) (2003), Best Chef Great Lakes (2007), Outstanding Chef (2008), Cooking from a Professional Point of View (for the Alinea cookbook) (2009), Outstanding Service (for Alinea) (2010), Best New Restaurant (for Next) (2012), and Who's Who of Food and Beverage in America (2012). Remarkably, my dinner companion, Charlie, and I were seated in the same spot where my wife and I sat nearly a decade ago. Is it ok to steal? Are there anymore ideas to swipe? Does it even matter? @Dabizdiverxo clearly is ok with it. Having say that, @Gachatz you must see The current menú Diverxo tonight in my tweetter .Do you really thing did i stole anything from you? 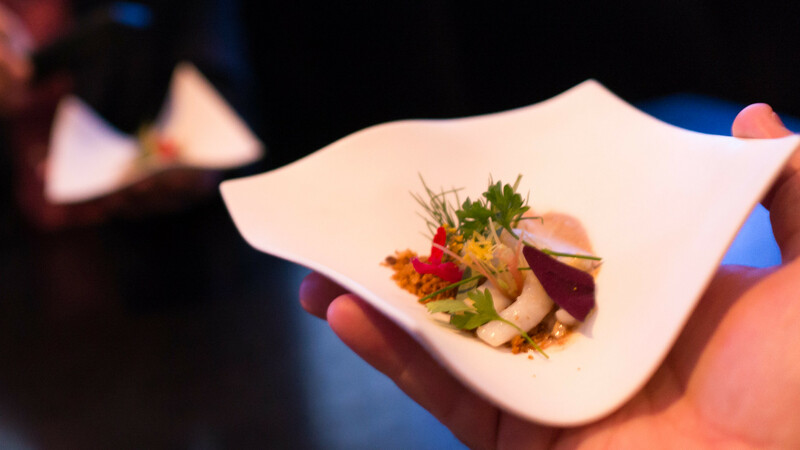 I've spent some time here kicking around the sensitive issue of "inspiration" versus "copying," and I understand why Achatz is upset – though it also seems rather petulant for someone who's already achieved so much recognition to make such a show of it. 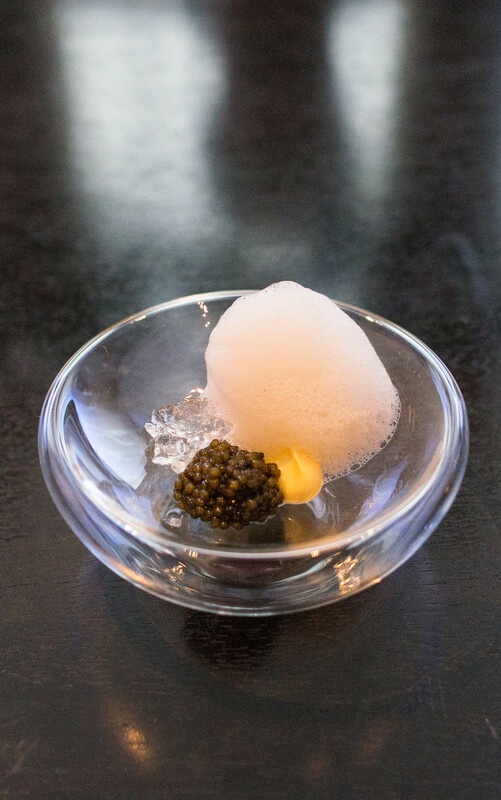 Can you imagine Ferran Adrià complaining on twitter because Achatz used his spherification idea in a dish? 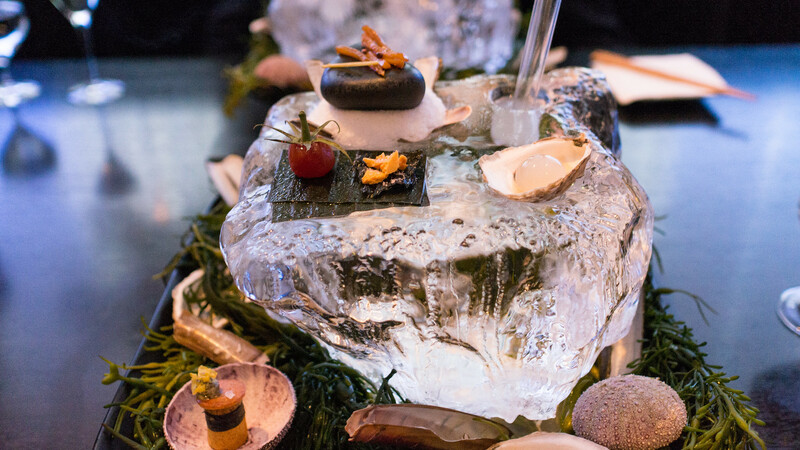 But then Achatz and co-owner Nick Kokonas have always been very protective of their ideas, even though using someone else's plating presentations, service styles and even recipes is typically not legally actionable. 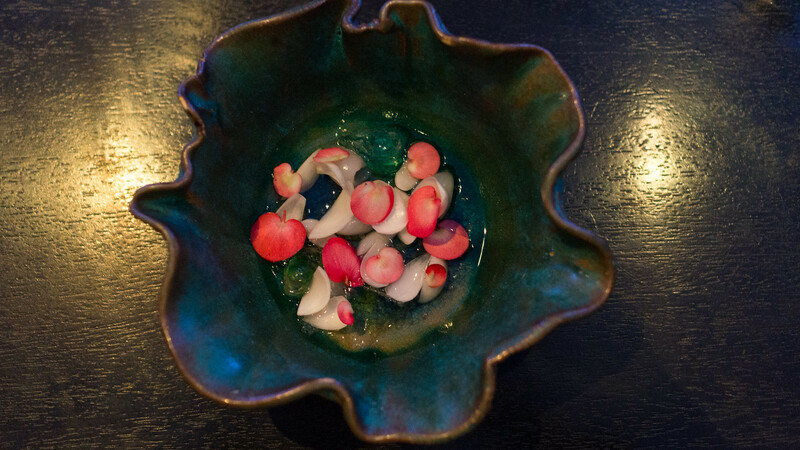 Again, I get it: within a year of Alinea's opening, a chef in Melbourne Australia was copying its dishes. A few years ago, Achatz called out a Miami caterer who was using Alinea images in their promotional materials (images, unlike the dishes themselves, are copyrightable). Then there was an Austin, Texas restaurant that copied Alinea's menu format. "It's really difficult to see other restaurants globally that are doing very similar things [to what] we've done four years ago, five years ago. Nick [Kokonas] texted me a link to a restaurant [where] they were taking people from the table and moving them to a different room. We did that four years ago. It's like everybody is into the theatrics of dining now. Either you're eating live ants or you're in a theater. I feel like everybody is conforming to each other. So we're trying to break away from following and come up with something new. Being original and doing a one-of-a-kind thing is what we strive for every day." (It should be noted, I suppose, that years before Alinea, El Bulli would often do a similar mid-meal change of scenery, serving a procession of snacks on the outdoor terrace when weather permitted before moving into the dining room for the rest of the meal). 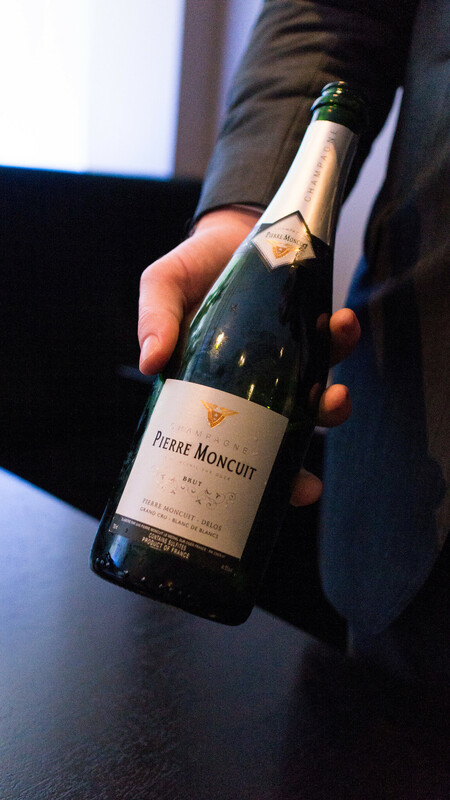 I've not talked much about wine pairings because, well, there's just so much to talk about, but they're actually one of the highlights of dining at Alinea. There are some straight up classics, like this Rinaldi Barolo, and others that are more esoteric, like Donkey and Goat's Mendocino Carignane, but they're all incredibly well chosen, almost always providing some smart accent point to the dish with which they're paired. Goat cheese is often rolled in ash to preserve it and encourage beneficial molds. I assume the grey hue here was a result of mixing the ash into the cheese. Not actually Chicago asphalt, our server felt obliged to reassure us. There's one trick here that I find particularly impressive and would love to see explained. As puddles of the rum sauce are spooned onto the table, they form perfect little rounded-edged squares. I'm guessing there are faint indentations in the mat, but it really is a great effect.